I gobbled down over the past few days. The delightful experience of reading Auden’s insights and real-world anecdotes about reducing the environmental impact of the Aspen Skiing Company reminded me of reading Paul Hawken’s “The Ecology of Commerce” in 1993 or hearing Interface’s Ray Anderson’s classic keynotes soon after. Inspiring. Hopeful. Asking for the best from business and all of us. 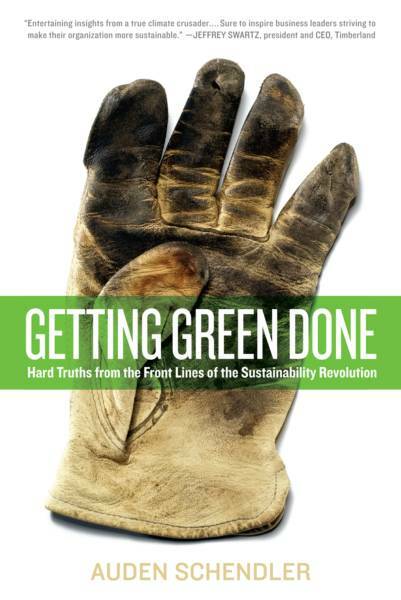 And yet “Getting Green Done” is a book for a new decade and responds to the urgency of this year by taking an extra step: in his on-the-ground projects, Schendler has won, lost, lost again, and he reflects honestly about the journey. He breaks with the sustainability pack that spreads the half-truth that “Green is Easy” and prepares us for the important yet challenging work of remaking our economy to support the viability of life on Earth. And makes us laugh along the way. We need to radically increase the ratio of grunts to visionaries, with fewer grand pronouncements made from podiums and more belly-crawling through the swamps. Having just returned from making grand pronouncements from DC podiums, this book stung in the best way. It is time to roll up our sleeves, people!